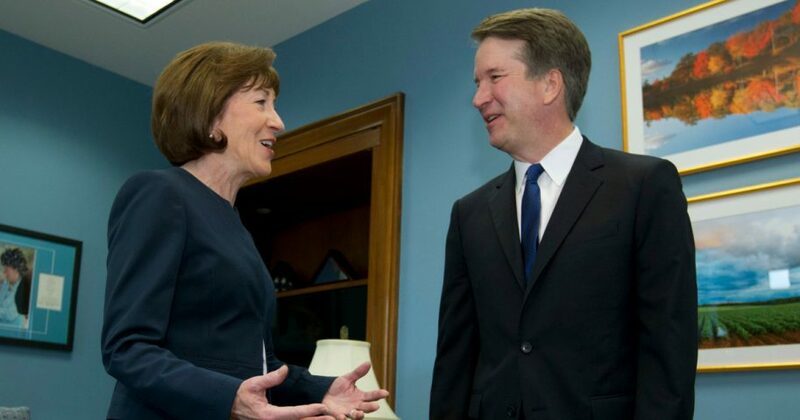 GOP Sen. Susan Collins of Maine, a pro-choice moderate who holds a decisive vote on judicial confirmations, met privately Tuesday with Supreme Court nominee Brett Kavanaugh. Speaking to reporters after the meeting, Collins said she had a wide-ranging discussion with Kavanaugh in which abortion featured prominently. “We talked about whether he considered Roe to be settled law,” Collins said. “We had a very good, thorough discussion,” she added. In that connection, Collins told reporters that she asked Kavanaugh about his dissent in a 2017 case called Azar v. Garza, in which the full U.S. Court of Appeals for the D.C. Circuit ordered the Trump administration to provide abortion access for an undocumented minor in federal custody. Kavanaugh initially joined the order of a three-judge panel giving the government several days to find a guardian who would procure an abortion for the unnamed minor — but the full D.C. Circuit reversed that decision over Kavanaugh’s dissent. “Today’s majority decision … is ultimately based on a constitutional principle as novel as it is wrong: a new right for unlawful immigrant minors in U.S. government detention to obtain immediate abortion on demand,” he wrote. The Supreme Court later nullified the decision, since the case was mooted prior to their review. Do you think Kavanaugh will be confirmed to the Supreme Court? That Kavanaugh would call Roe “settled law” is fairly unremarkable. Supreme Court nominees tend to acknowledge Roe’s staying power as a matter of course. Justice Neil Gorsuch acknowledged that Roe is a valid precedent repeatedly affirmed by the high court during his confirmation hearing in March 2017. What’s more, Supreme Court commentators have noted that the Supreme Court’s conservative majority is unlikely to mount a direct attack on Roe, preferring instead to neuter the ruling by chipping away at it over time. Collins noted that she has not yet decided whether to support Kavanaugh’s confirmation. “I have always waited until after the Judiciary Committee hearings before rendering a final decision on a Supreme Court nominee,” she said.